Posted on March 5, 2013 at 11:46 am. Auditioning is a craft in itself. Unfortunately, there are many good actors who never see the light of day due to poor audition technique. It’s not just about how well you act in the audition room; it’s also about how well liked you are by the people auditioning you. I know it might seem savage, but he did have a valid point. Let me explain. Someone who auditions well not only has talent but they also have the ability to seduce the audition panel. They know how to get on their right side and make people want to work with them. This is called building rapport. When you are in rapport with someone, you feel like they are on your wavelength. You like them. The thing is, you can deliberately build rapport with someone through good interview technique. It’s a skill. Something you can develop. Here is one that you should try out for yourself. You don’t need to go into the audition room either to try this out. You can do this with anyone. It’s called mirroring. Basically, when you are in conversation with someone, start to mirror their body language and vocal tones. If they cross their legs, you do the same. You wait a second or two after they have done it, then copy them. If they fold their arms, you do the same. Listen to how they talk. Are they loud and direct or quieter and slower in speech than you? Match your speech with theirs. I know what you’re thinking: ‘They are going to notice I am doing this.’ Not so. You will be shocked how many people never pick it up. However, their unconscious mind does pick it up and they start to believe you are just like them. We human beings are always on the lookout for people who are similar to us. We like people like ourselves. Try it out the next time you are out with a friend. You could even tell your friend and practise with each other and see how it feels. Another useful tip for when you’re in an acting audition is to try to avoid the word ‘No’. When you say no, it is a sort of rejection and brings the conversation to an abrupt halt. If you can, don’t say no and find a way to continue the train of thought. Obviously, if you have to say no because it’s important in order to be clear, then do so. But practise trying to turn a no into a yes. Does that sound tricky? Well, here is a short video from a live acting seminar I did on how to not say no in audition. I give you a real example from an audition I did many years ago. Acting auditions are nerve-racking experiences and any tool you can use to swing the decision your way is worth adopting. Remember: you will be doing the audition panel a favour. They want to like you and give you the part. You will be solving a big problem for them. The other reason audition panels like to get on with the actors they cast is that you may have to spend a long time working together – and who wants to work with someone who is a pain? Much better to cast someone who is similar to you. Want more useful audition advice? 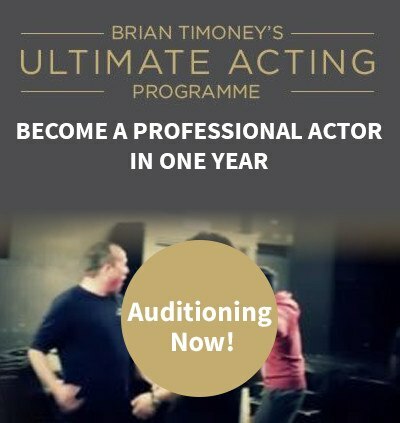 Why not sign up for one of my method acting courses?